County Carlow in Ireland is home to this skeleton of a once proud forge. Double-click on the image for a larger view. Photo kindly loaned by Paddy Martin. Throughout the lifetime of this blog, I have periodically shared evidence of a few special remaining buildings that are scattered around the globe. These buildings are usually in the British Isles. They are special in that they employ the simplest and most elegant form in nature, the arch, to emulate a horseshoe as the supporting doorway of a smithy or shoeing forge. True to form, as soon as you publish one, another one pops up. Or, in today's case, two pop up. We have Paddy Martin from Ireland to thank for these, and I do thank him heartily. The top photo is my favorite. The arch of the old forge may soon be all that is left. It was definitely the strongest form. Notice there is also an arch in the fence gate. And even the ivy on the cottage is attempting to imitate the form of an arch. This must be a magical place. I can't help but notice that the scale of this arch is more powerful than many of the horseshoe doorways seen in other smithies from days gone by. You could drive a truck through there, or a loaded wagon. Surely either this farrier was a proud man, or a prosperous one, or both, and that must have meant that the horses in the area enjoyed visiting a fine smithy, back in the day. But why hasn't it been preserved? There's certainly something beautiful in the neglectful state, but how long before it crumbles? 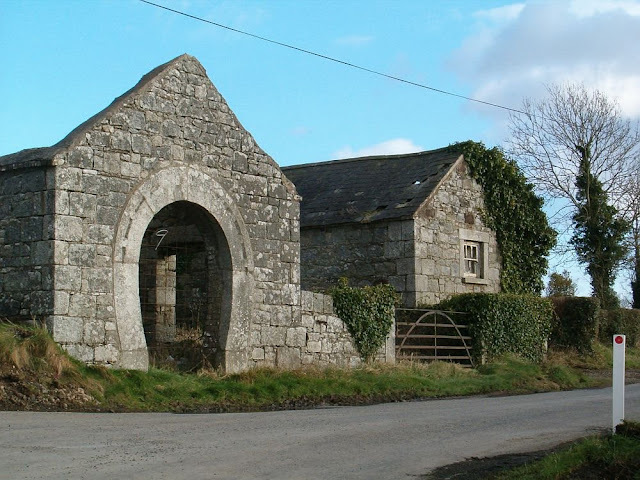 Paddy writes, "I'm now 60 years old and the first time that I saw this old forge was when I was walking or 'driving' cattle from a farm near Castledermot to another farm near Rathvilly in County Carlow...a distance of about seven miles. I was helping my father and I must have been about 10 at the time. I seem to remember the name Cummins or Cummings being associated with this old forge. At about 18 I moved away from the area and I have only become reacquainted since my daughter moved into a house two minutes away a couple of years ago. "The forge is located at Corballis Cross Roads which is on the 'back road' from Castledermot to Baltinglass through Crop Hill in South Kildare. The building itself seems not to be past restoration...must have a closer look when I'm there again." 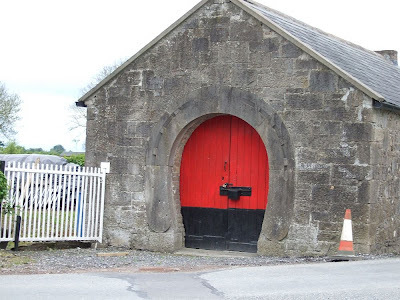 And this slightly different rendition on the arched doorway is in County Kildare. Photo kindly loaned by Paddy Martin. Paddy's second forge photo is one that I believe I have seen pictured before; he says it is on the road from Kildare Town to Rathangan in County Kildare. It is very similar to others found in Ireland but it doesn't have the single window above the keystone--or maybe it did and it has been bricked over. I need to make some sort of a Google Map with all these great old forges marked on it so someone (maybe even me, someday) could go on tour and visit them all. We could have some sort of a smithy architecture road rally up and down the British Isles. In order to win you'd have to have a picture of yourself in front of each forge. That's the sort of farrier competition I might be able to win. Very cool Irish buildings. I've never seen anything like that. Your blog is really great. Please keep writing it. which is pretty much about horseshoe forges, like it says. I'd welcome digital photos of any I haven't yet identified. I have the two you received from your friend Paddy.